Half Dome Village Yosemite cabins, formerly Curry Village, offer conveniently located accommodations, right in the heart of Yosemite National Park, giving you easy access to many famous attractions in Yosemite Valley and nearby. Book Online. Half Dome Village, formerly Curry Village, tent cabins, cabins and motel rooms are situated in Yosemite Valley, close to one of the most popular sections of Yosemite National Park. Sometimes called Camp Curry, this lodging facility is reasonably priced, making it the perfect place to stay when coming to spend some time in the park. Half Dome Village cabins Yosemite can be reached by taking California Highways 120 or 140 and heading into Yosemite Valley. Half Dome Village is one mile east of Yosemite Village. Half Dome Village is open from approximately May through September. You can also stay here from late September to mid-May in some of the heated tent cabins available. Call 888-413-8869 or Book Online. You have to make reservations early because of the huge popularity of Half Dome Village, even 10 months in advance. Here is a turnout where you can get an incredible view of the entirety of Yosemite Valley. This is another place where you can take in the breathtaking Yosemite Valley, and grab some photos as well. Hiking is the way to go to view this magnificent 600-foot waterfall. When in Yosemite Village, you have the Yosemite Park Visitors Center to visit as well as art galleries to tour. The Ansel Adams Gallery provides a unique view of the art of Yosemite Park. The whole family will enjoy the demonstrations of Native American lives. You can even learn how to weave baskets and do beadwork. See the highest waterfalls in North America, spilling in three separate cascades over the cliffs. A famous sight in the park, this is the world’s largest piece of solid granite, 3,600 feet high. There are many trailheads in Yosemite Valley that will take you on long or short hikes within the park. Half Dome Village, formerly Curry Village, has it all – motel rooms, cabins and primitive tent cabins without plumbing. The rooms and cabins don’t have televisions, telephones or air conditioning, in keeping with the natural environment of the park. Half Dome Village is typically open from May through September, but some heated tent cabins are available from late September to the middle of May. Although the accommodations here are more primitive than the other luxury lodging facilities, the prices are very reasonable. In Half Dome Village, the Stoneman House offers 18 standard motel rooms, each with a private bath, heating and maid service. The Half Dome Village cabins (56 cabins available) are wooden structures and have beds, desk, bath, wall heaters and outdoor decks or patios. There is also maid service, and blankets and linens are provided. 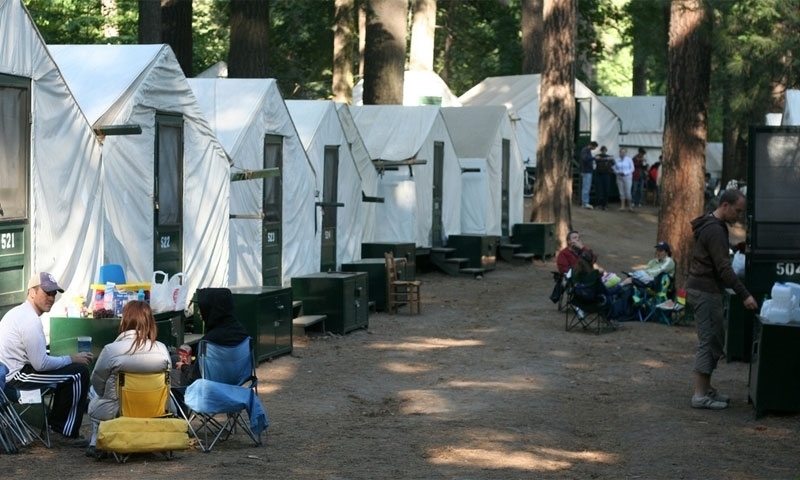 There are 319 canvas tent cabins, providing a certain rustic charm. They have wooden frame and floor and cot-style beds. Linens are provided, but no daily maid service. There are two central shower facilities and five restroom facilities located nearby. Two to five people can sleep in a tent. There is a limited availability of heated tent cabins from late September or early October to early spring. These 91 Signature tent cabins keep you a bit more comfortable at night as they have custom insulating panels. At Half Dome Village you’ll find a dining pavilion that serves a buffet breakfast and dinner during spring, summer and fall. There is also a coffee corner and bar. In summer you can swim in the outdoor pool and in winter skate on the outdoor skating rink. You’ll also have the convenience of a camp store and gift shop.